Esther Mollema believes that the strength of organisations lies in our individual differences. She is a thought leader and author on how to bring about diversity for better business results and profit levels. As a sought-after speaker, Esther has traveled the world sharing her insights on business, High Performance Organizations (HPO), diversity and inclusion. TheNextWomen have recognized Esther as one of the 100 most successful and influential entrepreneurs in the Netherlands. Esther is a thought leader and author of the book ‘50% Meer Talent’ (50% More Talent), which outlines how organisations can profit from adding more diverse employees to their board level and gives practical ways to achieve it. Her book ‘Succes in Veelvoud (Managing Diversity and Inclusion) details how to bring about diversity for better business results and profit levels. Esther has traveled the world sharing her insights on business, High Performance Organizations (HPO), diversity and inclusion. She has a special passion for helping those who want to enter female leadership and for influencing a change in implicit bias. Esther is a partner of the Professional Boards Forums (PBF) – hosts of events where talented women meet executives who influence non-executive director (NED) board appointments. PBF now operates in the UK, the Netherlands, Switzerland, Germany and Norway. Also working as a consultant to medium and large size organisations on how to achieve High Performance and instil a culture of diversity and inclusion, Esther uses her talents to insert the inspiration and achievement into her client’s businesses so that they have long-term innovation and success. Esther’s no-nonsense approach engages listeners of all levels, as does her fun delivery and empathy. The result is a unique mix appreciated by audiences both in the Netherlands and overseas. 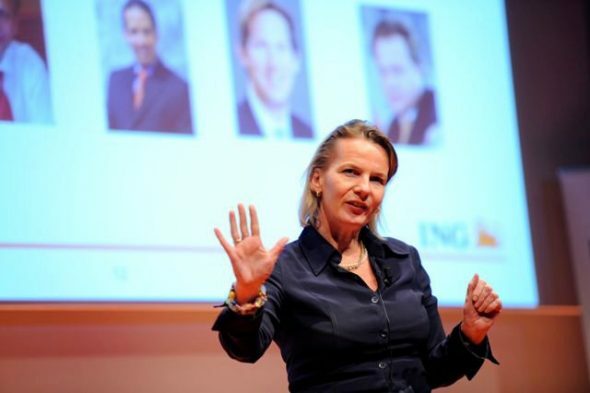 TheNextWomen have recognised Esther as one of the 100 most successful and influential entrepreneurs in the Netherlands. It all starts with recognizing and acknowledging our Mindbugs. How can you work with Mindbugs to strengthen your team, department and organization? Contact Esther Mollema for more information!